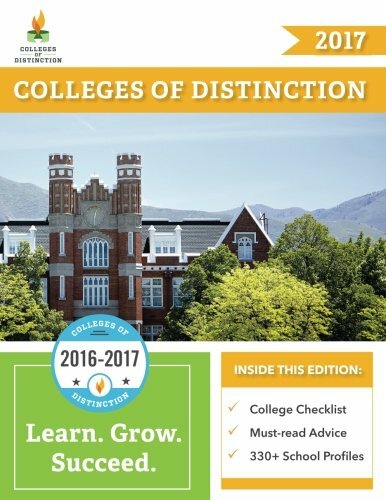 In Colleges of Distinction 2017, you’ll find a college and university reference guidebook like no other. Not only are there full-page profiles for over 300 schools, but you’ll also learn what qualifies a school as a College of Distinction, what questions students and parents should ask on a campus tour, and how to tell the difference between a good school and a school that’s a great fit for you. Our goal is to go above the biased assumptions of numerical rankings and popularity surveys of most college guidebooks. Our book of colleges and university profiles gives you a reliable, journalistic look at schools that may not have the biggest names in higher education, but that consistently do a great job keeping students engaged. Verifying that a school meets our high standards is a detailed process of interviews and hands-on research, so you can be sure that every school has been thoroughly vetted. Schools that qualify as Colleges of Distinction have smaller class sizes, a greater focus on students’ individual needs, and are run by faculty and staff that do an excellent job of preparing their students for successful careers and top-notch graduate schools. Buy this book to get best college reference guidebook on the market and master the college search process to find the school that’s right for you. What are high-impact education practices? The perfect school for you is out there–and you can use this book to simplify your search and speed up the decision-making process. There’s no risk–just download a free sample to check it out today!